“Steelman for Senate” has released a 30 second commercial with Governor Sarah Palin’s endorsement of her candidacy. Regular readers of this blog may recall the July 17th announcement of Palin’s endorsment for Steelman who is seeking to represent the fine people of Missouri in the U.S. Senate. But it’s the beginning of another one. As I’ve been predicting all along, it’s Miller Time! 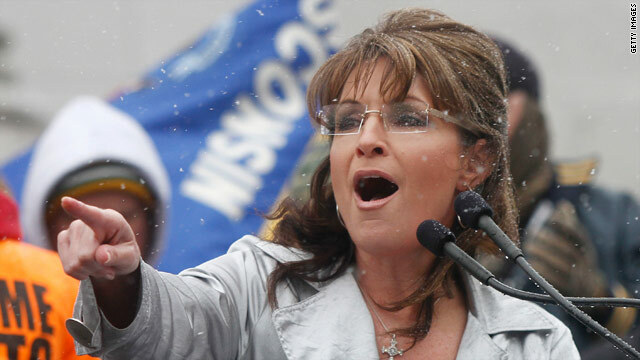 We’ve received the “miracle on ice” Governor Palin has been praying for. Now, on to November! 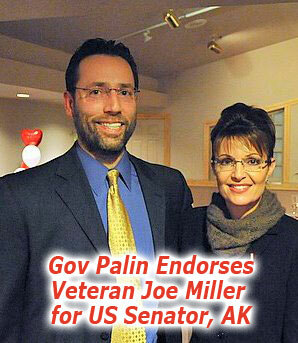 It’s Miller Time in Alaska as Joe Miller takes on Lisa Murkowski for U.S. Senate on Tuesday, August 24th. Vote Joe Miller! I want to remind the good people of Kansas to vote on Tuesday for Todd Tiahrt for U.S. Senate. He is a strong commonsense conservative who will serve Kansans with honor and help put our country on the right fiscal track. 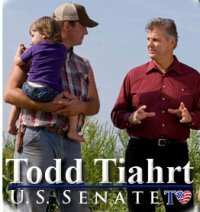 Read Governor Palin’s endorsement of Todd Tiahrt here. Kansas residents, make the common sense decision. Vote Tiahrt for US Senate. A true conservative from the state of Alaska is running for United States Senate. Joe Miller is that conservative, and he is positioned to unseat Lisa Murkowski whose record shows her to be anything but in touch with the people who sent her to Washington to represent their best interests. Rather than standing up for conservative values, she has demonstrated a Liberal bent that is not what the people of her state expected of her. This is just one reason it’s Miller Time! Listen to this radio ad which includes audio of Lisa Murkowski stating that American taxpayers are not concerned about the amount of money Congress is spending. Her attitude is precisely the problem in Washington today, precisely why common sense conservatives are counting down the days to the November mid-term elections, and precisely why Governor Palin endorsed Joe Miller. So what are Alaskans saying? My friend, Tracey Porreca, in her article, “Another reason I’m voting for Joe Miller,” gives her take on why America needs Miller in and Murkowski out. Read her article here. Murkowski’s grades beg this question: is this the best we can do? The answer is a resounding, “No!” Not when there’s a better a choice. Joe Miller is that choice. Alaskans, your vote impacts the entire nation. Vote Joe Miller in the August 24th Primary. Visit Joe Miller’s website at http://www.joemiller.us/, and follow him on Facebook and Twitter.